Can a card with X mana cost become cheaper? 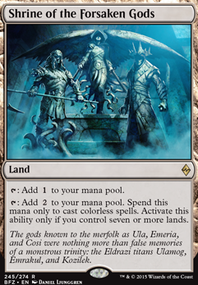 Eye of Ugin and colorless mana symbols..
ToolmasterOfBrainerd - thanks for the clarification on these. I took a pretty long break from Magic, so was not overly familiar with how some of these cards had been played. I’ll be honest, my evaluation of Mental Misstep , however, was quite bad, considering Thoughtseize , Path to Exile , and Lightning Bolt are arguably the best cards in the format. I disagree, however, with your analysis of Eye of Ugin . Rather than show why it would be fine to restrict Eye, I think your analysis goes to my point. 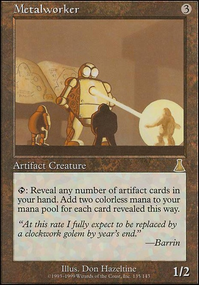 Even when it was being run primarially as a one-of, Wizards still coins it powerful enough to be worthy of banning. Your example just goes to show how degenerate a single card can be once obtained. Icbrgr this has nothing to do with the thread... but I get the sense you're relatively new to competitive card games as a whole. A lot of your arguments center around "well x card is fine because its answered by x other card" but there's a huge factor that's missing from your analysis: tempo. Let's build a hypothetical game of Hypergenesis v Eldrazi. The Eldrazi player plays a Chalice of the Void for 0 to counter Hypergenesis . Luckily, the Hypergenesis player is running Kolaghan's Command so he has an answer! 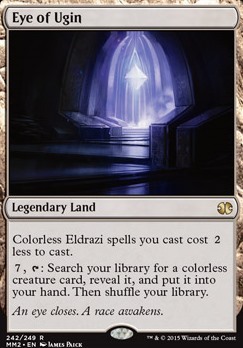 By your logic, this should mean that hypergenesis won't struggle with Chalice of the Void , because Eldrazi has a card and Hypergenesis has an answer. Here's the flaw in your logic that reveals your (probable) inexperience. Chalice of the Void cost the Eldrazi player 0 mana. Kolaghan's Command cost 3 mana. 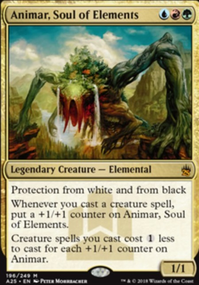 That means that the Eldrazi player came out of that exchange up by 3 mana, which is a form of "Tempo" as it's labelled. 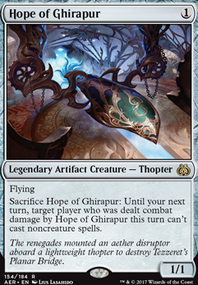 The eldrazi player could resolve anything from a Matter Reshaper to a Reality Smasher (if Eye of Ugin is in play) using that 3 mana. Let's investigate what Hypergenesis could have done with that 3 mana instead. It could have played Violent Outburst cascading into Hypergenesis and WON THE GAME! An eldrazi player drops an Eye of Ugin . they already had a waste in play. The eldrazi player gets to play a Matter Reshaper . His opponent drops an Alpine Moon naming Eye of Ugin . Here's the "tempo breakdown". The Eldrazi player just came out 3 mana ahead AGAIN. he got one mana out of Eye of Ugin discounting the Matter Reshaper as compared with a regular land. That's +1 mana. Alpine Moon turned Eye of Ugin into a land which taps for mana. That's +2 total mana. The Eldrazi player's opponent had to spend on Alpine Moon which he couldn't spend on something else. Thats +3 total mana. HUGE tempo swing in the eldrazi player's favor, which means that this interaction is actually favorable for eldrazi. By your logic however, The eldrazi player's opponent SHOULD have come out ahead because his card "answered" the eldrazi player's card. If you still aren't understanding this... tempo can be a complicated concept. My honest recommendation is to play magic as frequently as possible, and maybe get into competitive Hearthstone for a while before you get fed up with Hearthstone's stagnant metas and give up on the game. For all its flaws and stagnation, Hearthstone is a great learning ground for core concepts of competitive card games (sequencing, value, tempo, win-conditions, etc). What I'm getting at is this: Sometimes it costs your opponent more to answer your card than it costs you to play it. In that situation, it doesn't matter that your card got answered, because you came out ahead on that exchange. That's the core of why Eldrazi decks are broken: They are tempo monstrosities that are nigh on impossible to stop IN A FAVORABLE MANNER. Eye of Ugin / Umezawa's Jitte / Cloudpost are the only cards i saw as a common theme in eldrazi brews that are currently banned (i would have to look deeper into that though)... so far when discussing eldrazi those cards at least havent really popped on the radar/discussion by name....mainly Chalice of the Void which is interesting. caw blade was just something said earlier in this thread in in regards to a deck being unable to be hated out/kept in check....i respectfully disagree...i think there would be very very strong decks and certainly miricles and eldrazi are among them.... but i feel that there is opportunity for brewers to prey on them... whether its a super jund/manaless dredge i really couldnt say. "Miracles is a deck that with Top and the other cantrips, especially with a way to counter a spell turn 1 and resolve top allows you to obliterate any opposing deck. There would be no other deck. and then the conversation evolved from there with people thinking that Through the Breach or Caw-Blade would be too oppressive.... and now Eldrazi is the subject matter... yet little is being said about how Eye of Ugin is what is making it so oppressive. its just really interesting stuff....and again i think Modern would be a fun and interesting format to play in even without a ban list. "if it looks like a duck... quacks like a duck...".... no Chalice of the Void is certainly not a permission spell that goes on the stack; but i think its obvious that its role in anyones deck is similar to Blood Moon in the sense that they are Restricting and denying resources and actions of the opponent... people who run Chalice/Moon build their decks around them....and in time the meta adapts to this. Eye of Ugin is powerful but there are several accessible answers to it in the same way.....take jund for example....hand disruption with Thoughtseize ...easy enough to throw in Alpine Moon and Abrupt Decay / Assassin's Trophy .....there is just so much removal...like a lot of removal... to be able Fulminator Mage /Fulminate a land, Bloodbraid Elf /Cascade into Kolaghan's Command /K-Command, get Fulminator back.... im just not convinced that eldrazi cant be dealt with. as far as the mulligan scenario is concerned... Serum Powder exists...but nobody is always gonna have there best cards every game...thats why its a game.